I’ve only been in Nicaragua a few days now, but that’s enough to confirm that this country still offers the cheapest overall prices in the Americas. Bolivia is probably a close second—I’ll report from there first week of November—but the reciprocal visa fee they hit you up with upon entry means you’re $140 or so behind before you even leave the airport. Honduras isn’t much more either on the mainland, but the islands can get expensive. The first photo here kind of says it all. It’s 23 cordobas to the dollar right now, so some of those happy hour cocktails are 2 for $1.50. I can’t think of anywhere else in the world where it’s that cheap to drink at a bar. Heck, when happy hour’s over you could order 6 rum cocktails, leave a dollar tip, and be out only ten bucks. 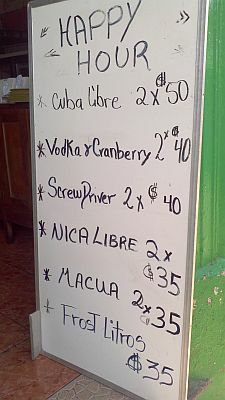 And these are not some moonshine drinks either: the macua is fresh juice and local rum. Yum. So far the most I’ve spent on a meal outside of a hotel is $6.50—dinner in a nice place with two beers. 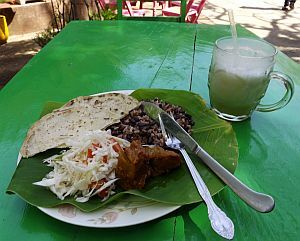 The $3.50 lunch below was from right in the main square in Granada: spicy pork, rice and beans, warm tortillas, cabbage salad, and a pineapple smoothie. My mid-range hotel room in Granada, with Wi-Fi, breakfast, and air-con was $31. If you go down a few notches, this is a country where you can still find a hostel bed for $5 or a room for two to share for less than $10. The express bus (sorta) from Managua to Granada was a dollar. A half-day bike rental is 3 or 4 dollars. I’ll do a more detailed post later after my trip is finished with a wider range of prices, but if you’re looking to get a lot of bang for your buck, come hang out in Nicaragua for a while. 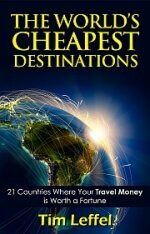 See more posts on the cheapest places to travel in the world. If those prices were dollars, it would be about what I spent in Copenhagen last summer. That will sober you up in a hurry. That is cheap compared to most of South America. Can I ask you where you found your hotel room? Thanks. I tend to use a mix of methods to find hotels, but prefer ones with character and a sense of place rather than the type typically listed on the big booking engines. So the hotels where I stayed in Nicaragua I found using two cross-referenced guidebooks: Moon Handbook Nicaragua (which I carried with me) and Frommer’s Nicaragua and El Salvador, which I checked out from the library for pre-trip research. In my experience, guidebooks are still the best sources for independent hotels—I trust the writers because they know the whole scene, unlike TripAdvisor reviewers who have likely only stayed in that one place. Wow, indeed… the pricing difference is incredible!